What’s the best place for a guerrilla soup kitchen? NAP during the race again! Election is Not the Same As Selection! You’ve got the power to choose who will rule the country after September 23rd – we’re all waiting on your input! Your vote will help elect a Prime Minister and ruling party. You will have a range of choices of both electorate and party candidates – some voters will have over 25 options. That’s democracy, right? The people choose, right? Not really. The tricky thing is that your input regarding the selection of the candidates is not asked for. The process that led to either Bill English or Andrew Little becoming one of your only two choices for Prime Minister is not under your influence, not even in the slightest. As Richard Goode of Not A Party pointed out in a recent address, New Zealand has had either a National Party Prime Minister or a Labour Party Prime Minister for the past 80 years. And you don’t get to select either of those. You get to vote for one list of people that you have zero input into, or another list of people that you have zero input into. So what your vote amounts to, as an elector, is little more than a ceremonial acknowledgement of the completion of a process that started a long time before election day. Like the Queen cutting a ribbon to open a new library, it’s merely a show for the cameras. The process that matters – where the political power is – is the process that puts a person into the position of leading their party in the first place. And the Establishment will have seen to it, as it does every other time, that both the National leader and the Labour leader are their puppets. 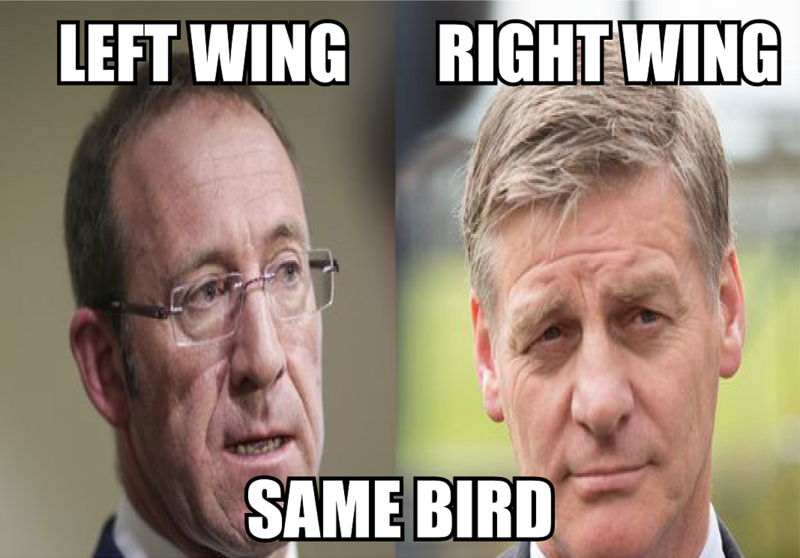 So it doesn’t matter if you vote for the left wing or the right wing of the shitbird – the leaders of both wings have been selected by the people who really have all the power in society, and it isn’t you. That’s why Andrew Little and Bill English are indistinguishable when it comes to several major social issues. On the issue of cannabis law reform, Little is no less conservative than English, constantly harping on about brain damage, and the Labour Party policy webpage makes no mention of cannabis law reform whatsoever (although funding a motion-capture studio in Dunedin was important enough to mention). In the end, we shouldn’t expect Little and English to be distinguishable. What the rulers of this country want is to frighten the markets as little as possible, and that means reducing democracy to a sham election between two candidates pre-selected for their total absence of any capacity for novel thought. Ultimately, the people who benefit from the status quo have far too much invested in it to allow it to be upset by plebs like you! Not even voting for a third party is possible. Watching the Green Party mortgage their soul at ever-increasing rates of interest over the past 18 years taught us one thing: a maverick third party can only win power in our system to the degree that it makes itself indistinguishable from those who already have it. That the country will be led by someone who sees you as a unit of livestock to be milked for productivity and taxes is a given. It might appear that the only reasonable course of action was to refuse to vote and to work on building a parallel society away from the gaze of psychopaths beholden to international banking or ideological interests. website on But If I Don’t Vote, How Can I Be A Valuable Contributing Member Of Society? Johnette on But If I Don’t Vote, How Can I Be A Valuable Contributing Member Of Society?